Club Penguin Cheats by Mimo777 Club Penguin Cheats by Mimo777: Gary Says Field Ops Returning Soon! Gary has sent us a Club Penguin update on Field Ops! 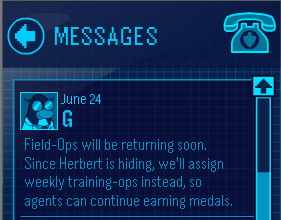 So, Field Ops will be returning soon! Are you glad they are coming back? Im really glad field ops are coming back! They are really fun challenges for me! AM I HAPPY (77)?! OF COURSE I"M HAPPY!!!!! Cool! I really need to start doing missions again, even if they are training ones! i don't really do field ops, i just leave them there... well yeah i guess that's cool. Field ops are NOT coming back. They will be replaced with Training ops. So that way we will prepared for Herberts next attack. Hey Mimo777 your awesome and I would love to meet you on CP maybe sometime and don't forget to send me a e-mail.